Is it possible to delete my account and the shared tests? I did not realize that the test results with my name would be shared when I used my real name for user name (user name = jeff______). I would like to create a new account with another user name if possible. If you need your account deleted for whatever reason Contact TMN - If you only need to delete test results please read about how to Delete Scores instead. Thank you. I will use _______ for username. I really like the testmy.net site and tools. Thanks, it's my life's work. I've poured more time into programming that site than anyone can even imagine. I appreciate the support. I very much appreciate your doing this. It is rare to get such prompt and effective help from anyone these days. 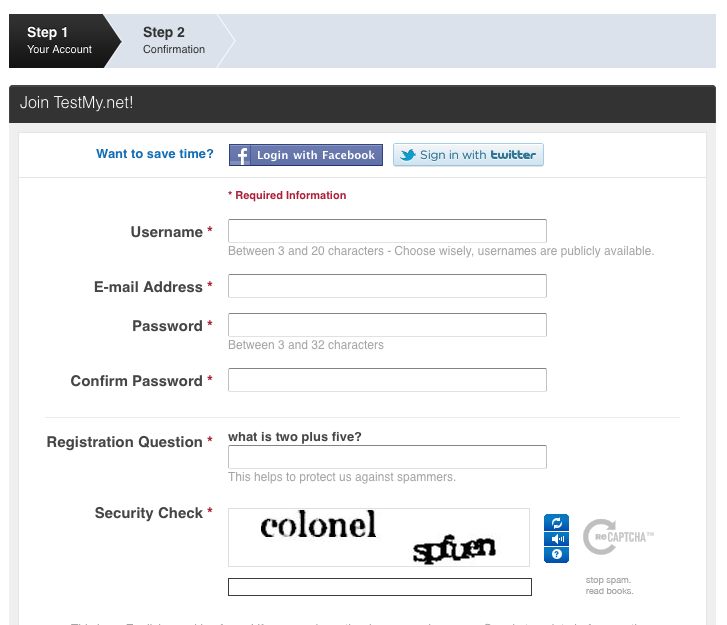 I will definitely keep using testmy.net and recommend to others. Don’t worry about transferring old results if it is any effort. I’ll be using the automatic testing again so I don’t need the initial tests. Let me know if you need anything else... no, I don't have winning lottery numbers. Please remove my account because I am concerned with my privacy and my previous user name. The account XXXXXXX has been removed.